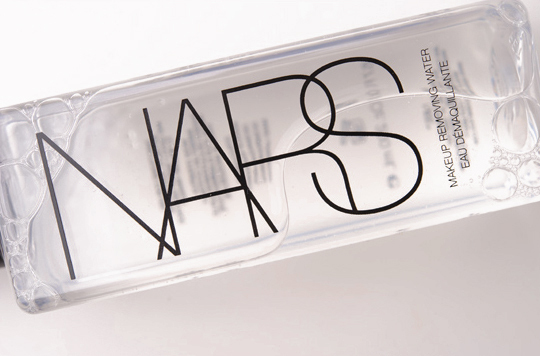 NARS Makeup Removing Water ($28.00 for 6.7 fl. oz.) is touted as a “soap-free, oil-free, and alcohol-free water that removes face makeup and tones the skin.” It’s designed as a gentle formula that will remove makeup without requiring rubbing while hydrating skin. This is a makeup remover that is best described as gentle, because that’s exactly what it is, but it’s gentle in every way–it’s not at all stinging, burning, or irritating against the skin, even around the eyes, but it doesn’t effectively remove all your makeup, though it specifically says “face makeup” and not “eye makeup.” Just so we’re clear: if you wear eye makeup, don’t expect this to do much in the way of removal. All it ever seems to accomplish is smudging everything around so I end up looking like a mutant. I absolutely would not use this for anything that says “long-wearing” on the label, including face products. If you want it to remove light eye makeup, I recommend gently pressing the soaked cotton pad against the eye for 15-20 seconds before gently swiping the product away. You’ll get some, perhaps not all, of it removed this way. Since NARS only mentions face makeup, it seems like you would use something else for your eye makeup. It’s packaged in a clear plastic bottle with a flip-top that has a small hole so only a little comes out as you need it. I’d like to think of this as a remover for gentle makeup; lightweight, natural, soft makeup. However you want to term it, it’s good for lighter makeup days. For me, it seems to remove face makeup as well as most facial cleansers are able to. It is very lightweight, doesn’t feel greasy or oily against the skin, and it leaves no trace of residue once it’s wiped away with a cotton pad. It really does have the consistency and feel of water. There’s no stickiness, dried, or tightened skin after use either. I need at least two cotton rounds in order to remove about 90% of face makeup. It doesn’t remove makeup completely, so I feel like I need to use a cleanser afterward or yet another cotton pad. Instead, the way I found this product to be most useful was after using a facial cleanser, so it was only responsible for removing the last bits of makeup the cleanser missed. You can definitely use it before your cleanser of choice as well–I just like the visual of seeing the cotton pad just picking up stray makeup and knowing that my face is clean. It also means that I can better control how much product or how many cotton pads I use since this doesn’t eliminate a cleanser. It’s a superfluous product in my night time regimen; it seems to be an extra step rather than a time-saver. It’s more like a toner in my routine–I don’t trust it to remove all my makeup, but I do trust it to remove the last vestiges of makeup my cleanser may have left behind (especially around my hairline and the edges, which I don’t push the cleanser around as much so it doesn’t get into my hair!). And if I’m going to use NARS as my toner, I’d rather use their Hydrating Freshening Toner, which is one of my favorites, and for me, hydrates a little better than the remover does. You can use this like you would a toner, however, so if you do include one in your regular routine, this could take its place. If you’re a fan of micellar water removers, then you may enjoy this recently launched remover by NARS, which has all the earmarks of one (though I didn’t see NARS officially billing it as such). There are quite a few on the market internationally and a couple in the U.S., but this year has shown major progress with more U.S. brands launching their own versions. Bottom line: this will remove some but not every type of makeup, particularly longer-wearing products and heavier textured products, but it’s not designed to do much more than it does do, so it’s pretty good from that standpoint. Water, Butylene Glycol, Peg/Ppg-35/40 Dimethyl Ether, Phenoxyethanol, Ethylhexylglycerin, Trisodium Edta, Cucumis Sativus [Cucumis Sativus (Cucumber) Fruit Extract], Chamomilla Recutita [Chamomilla Recutita (Matricaria) Flower Extract], Sodium Hyaluronate. The first time I saw the word “water” on a cleansing product (it was Dior) I had no idea what to use it for. So it’s a makeup remover then. Nah, I’ll stick to my $6 Neutrogena. Thanks for the very thorough review though! As much as I love NARS, I think I’d rather put the $28 toward an eyeshadow duo or single. If it were effective in removing eye makeup as well, it may be worth it, but I love Lancome Bi-Facil for that, unfortunately it’s too oily for my face. I really love the idea of this product, but since I use sensitive skin baby wipes for the exact same function, the Nars product doesn’t make sense to me. But is it wrong that I want it simply for the bottle? Thank I was just shopping over the weekend for a new cleanser! I went with 100% Pure, good to know this is for very light makeup! I’ll stick with my Embryolisse Lotion Micellaire water as it work with my skin nicely and you get a bit more product for a slightly cheaper price as well. Micellaire are in general not a first step cleaner unless your using it for clean ups. They just won’t take off long wear products I find and i use a fair amount of, but the one I use already does purify the skin of and thing left over in the pores and I tend to use mine after washing my face and that dose clean off any residue. They seem more like toners to me, so they can clean off any residual traces of makeup and leave skin feeling refreshed and prepped for your moisturizer! i use bioderma solution micellaire and i feel like it gets just about everything. i still wash my face with a cleanser after, because after a whole day, my face needs to see some actual water. but i don’t need the cleanser to get my makeup off. I also use Bioderma, and it takes everything off. I generally just use it to take off my face makeup as soon as I get in the door, and I follow up with a full cleanse in the shower later that night. I have dry skin, so leaving foundation on for too long can get uncomfortable, so I like to get it off my face as soon as possible. I have used Bioderma to remove eye makeup, but I generally like using a cleansing oil for that. Does the Bioderma remove all of the eye makeup, though? So… it’s a makeup remover that doesn’t actually remove makeup… $28USD for water, alcohol, glycol, ETHER, glycerin and some plant extracts? Totally wasted step and $. If I really have a need for a pre cleansing makeup remover, I use one of 2 things – 1) facial cleaning towelettes (fav Ole Hendrickson – but I guy Nutrogena often because it’s easy for me to get and more for the $), 2) I also use at times a cream makeup remover by Adriean Arpel (sold now only on HSN under Signature Club A) a product I used when she was still in dept stores – her Meltdown. I only need a product like that when I really have piled on the eye makeup and I don’t want to have to pull and tug at my skin to remove it and take tons of eye makeup remover and Q-tips to get the last off only to find I still need more eye make up remover – more q-tips etc. I need something soft like that #2 product in my arsenal. I am also I should add, not a fan of Nars for skin care..it’s a color line in my mind! Surprisingly, I really like it, but it’s less surprising since it’s owned by Shiseido. I love the Hydrating Gel and Freshening Toner! A lot of the time I’ll use something like Lancome Bi-Facil or an equally super-charged makeup remover for heavy eye/lip makeup, because it really breaks it down quickly and effectively AND then I don’t have a bunch of green and blue and mascara running down my face while I’m cleansing. For lighter makeup, facial cleansers get most of it, then a toner to follow. But realistically, I usually opt for shu’s cleansing oil since it cleanses and removes makeup in one step. It seems so random, but the BEST makeup remover I’ve ever used is by Victoria Secret. And it’s not expensive! Maybe I’m alone, but I actually LOVED this product. Cleansing waters are amazing in my book, especially for lazy nights when you’re too tired to go through a full cleansing routine. My go-to before was Caudalie’s cleansing water, but it is fragranced and I prefer facial skin care that’s fragrance-free. I found that the NARS cleansing water removed my face makeup and eyeshadow efficiently, and I go through every makeup step haha (primer, concealer, foundation, setting powder, blush, bronzer, and highlighter). But that was just my experience! I just started using the NARS skincare line. I love it! I use the NARS Makeup Remover Water before using their cleanser. NARS also makes a eye makeup remover as well.